E ARC from Edelweiss PlusWhen Beatrice's father gets a job as the head of the history department at the American Academy in Rome, she is angry that they have to leave their home in Boston. She's not given a choice (her father is very fortunate to have a job! ), and the two are soon ensconced in the Jewish Ghetto. Beatrice wants to explore, and her father reluctantly agrees. She meets a few other children who speak English, uncluding Marco, and starts to establish some routines. When she is awakend one night by a clanging from the fountain in the square, she looks out and see a man stealing the sculptured turtles from it. The next morning, however, the turtles are still there, although their position seems slightly off. Even though she is busy with exploring and taken Italian lessons from, Beatrice is enthralled with the story of the Palazzo Mattei and the fountain that was built overnight. 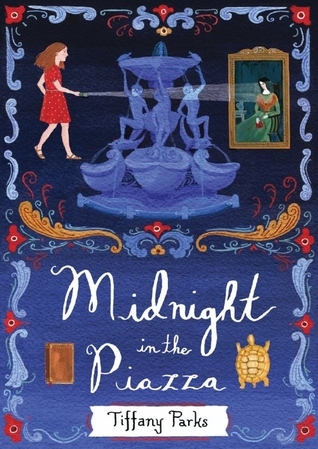 The more she investigates the palazzo and the turtles, the deeper Beatrice gets into a complicated mystery in which her own tutor might be involved! Will she be able to use her skills of deduction to figure it out before an important piece of history is lost for good?Strengths: The details about living in Rome were just exquisite, and I loved the fact that the mystery was happening actually in her front yard. This is great for students who like Blue Balliet's art mysteries or Marianne Malone's The Sixty-Eight Rooms but also for anyone who wants to live in a new and exciting foreign city. I want to go get some gelato and eat it by a fountain right now!Weaknesses: I never understand why tweens don't want to move to foreign countries-- how fantastic that would be! Also, I couldn't believe that her father didn't use a computer. In academia these days? Pfft. The history professors at the University of Cincinnati were all about computers when I was there in 1987, so that stretched my credulity.What I really think: This reminded me a bit of Runholdt's Kari and Lucas mysteries or Gonzalez's Moving Target books, which see a steady circulation in my library. Also a bit like the very new Asselin and Malone Art of the Swap book. It's not the gory type of murder mystery that my students want, but it involves traveling to Italy, so I'm sold! As a girl who grew up on Trixie Belden and Nancy Drew, I personally enjoyed reading about 13 year old Beatrice Archer and how she solved the missing turtles and other woks of art. Tiffany Parks does a great job visualizing Beatrice as she follows her instinct and the clues.Parks did an excellent job capturing the feel of a 13 year old girl, who was being torn away from everything she knew and set loose in a new place. She also convinced me that we were in Italy. My one issue, more as a parent than a potential young adult reading this, is that I would never allow my 13 year old daughter to wander free in a new country with such a language barrier. I also doubted that a university professor was not more computer literate.That said, all in all I enjoyed the book and would suggest it to any young adult who enjoys mysteries, or travel.Disclaimers: The book I read was a paperback not an ebook but I did not have that option. I did acquire the book through a giveaway here on Goodreads. Tiffany Parks - Tiffany Parks grew up in the glorious Pacific Northwest, but it didn’t take long before she heeded the call to roam. She moved to Boston at 18 to study opera, earning her Bachelor’s of Music from New England Conservatory of Music, and later her Master’s from the Université de Montréal. Realizing she still wasn’t quite far enough from home, she fulfilled her lifelong dream of moving to Rome, where she fell head-over-heels with the art of Caravaggio and Bernini. With the Eternal City as her muse, she writes for numerous travel publications and her personal blog, The Pines of Rome. She also co-hosts The BitterSweet Life, a podcast exploring the joys and frustrations of the expat experience. When Tiffany is not writing children’s fiction, penning a travel article, or taping an episode for her podcast, she can usually be found exploring Rome’s monuments and museums with her Roman husband and son.